Open floor plans are de rigeur in the high-tech industry, but they have also become trendy of late in other industries as well. The are loved by some, hated by others. On a purely aesthetic level, I quite like open-floor-plan spaces. After all, CatSynth HQ is a two-level open-plan space. When they are modern, with lots of light, air, glass and metal, they can be quite beautiful and inviting. The example from Mozilla’s UK office that opens this article is one such example. On the other hand, some can just be boring and utilitarian, as if someone just took an old office space and knocked out some walls. Aesthetics aside, the problems with open plans aren’t the spaces themselves. It’s what happens when you put a lot of people in them. For some, a busilling hive of activity with constant access to other people can be a boon, but for many is a source of intense anxiety and can feel even more confining than a small private office. Many of the examples in the main article as well as a follow-up featuring stories from readers focus on the extra pressure women feel about their appearances in these environments. Interestingly, my own experience is somewhat different, but retains the overall sense of pressure. I usually dress up and always wear makeup for the office, because I enjoy it and it makes me feel good. But I do feel very self conscious in the open spaces in different ways. First, I am worried about how mistakes or faux pas may be visible. And in the world of high-tech, the almost religious embrace of casualness and the way many men, even in leadership, treat their slovenly appearance as a badge of strength or honor, can add subtle pressure. As a woman, does one fit in, trying to be “one of the guys”, or be oneself and stand out in the sea of casualness? I could write an entire article just about attire and dress codes – and I will – but there are other forms of sexism at work in open spaces as well. 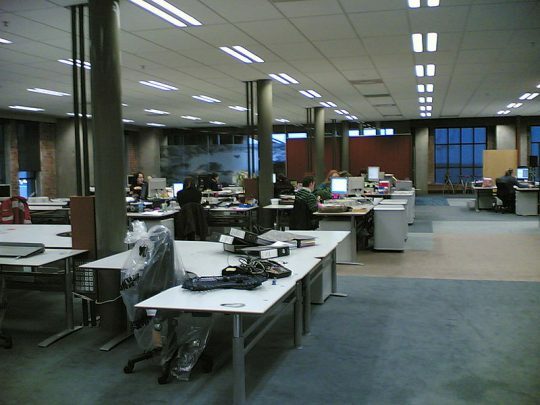 “The open plan office was in a college and not only was it very exposing as the managers were in a mezzanine level and looked down on us but the desks were butted up against each other and in rows. There was absolutely no privacy, and judgments about folks were made that amounted to a kind of covert bullying. Any absences from the room were noted and commented on. There were two small meeting rooms but they required booking. There was no room to spread documents out if you needed to and anyone could see what was on your screen. Most of us adopted a kind of blindness/deafness to our neighbors. It was also noisy at times, which impacted our concentration or ability to conduct telephone calls. I stuck it out for a year but was relieved to leave. I have myself experience the stress and drain that comes with the lack of privacy in open spaces, the constant feeling of being watched. I have also had to deal with novel types of bullying that are rarer in closed spaces. On several occasions at multiple companies, I found myself chatting with a colleague about a technical matter related to a task at hand, only to have a male colleage come charging over and offer his unsolicited opinion – the ubiquitous and annoying phenomenon of mansplaining. Sometimes he would be wrong because of missing context, but this did not stop a confident and overbearing manner, which crosses the line into bullying. One particular egregious example involved my explaining an iOS-specific design requirement to a colleague working deliving a graphic, when suddenly a business-focused male coworker came over and erroneously explained why I was wrong – on top of this, he didn’t even address me directly, just my male colleague at the neighboring desk. Similarly, some workplace bullies (invariably male in my experience) will use the open space to verbally corner or humiliate a co-worker, something that is unpleasant even behind closed doors, but far worse when it is in view of the entire company. Then there is the simple problem of constant distraction. As someone who is trained to use her ears critically, it is difficult to not be distracted by constant conversations happening in an open space, some of which can even be amplified by the acoustic properties of the space. It is possible to filter them out metally, but this takes a lot of energy that is then drawn away from actually getting work done. Many companies, including the one I described in last week’s article, have taken to offering noise-cancelling headphones to workers. While it does cut down on noise distraction, these is merely a band-aid on the problem, and a band-aid that can itself lead to other problems like ear fatigue. “I was one of three women at the company. I struggle with anxiety, and the cramped, nowhere-to-hide office layout made matters worse. When I felt an anxiety attack coming on, I would walk a block to a hotel around the corner and hide out in their basement bathroom until things subsided. “It wasn’t until after a few months of working there that I mentioned this to my other female coworkers and found that they, too, had ‘hiding spots.’ One had a sibling who lived nearby and would go to his apartment, another would go to a department store a few blocks away. Of course none of these issues are unique to open floor plans, and many aren’t caused by them. Sexism and bullying is rampant in a great many environments including the virtual world. But an open work place where one feels trapped in the gaze of others can make it far worse. Like Emily in the last quote, I look to companies that offer a variety of heterogenous spaces, some private, as well as opportunities to be remote from co-workers. And I appreciate companies that put a priority on their workers’ mental health and well being as part of their operations. 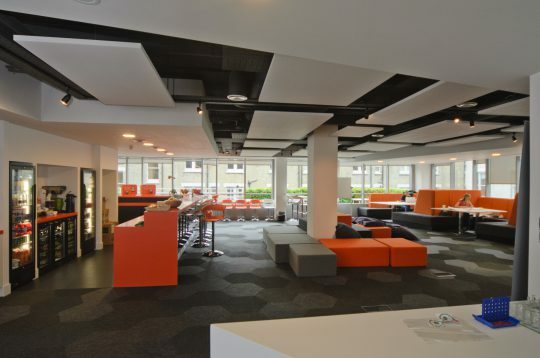 It remains to be seen how that plays out in particular in the “forced-togetherness-as-virtue” tech industry, and whether some firms move away from open plans towards more variety of spaces.